Did she really wake up like this? Maybe..maybe she woke up splashed on some magic and then boom perfect selfie! Look most times it takes girls (at least I know for me anyway) there are 10 or more of those selfies that just don’t make the cut. I’m not a huge makeup girl, so if you see me with makeup on (and in March you will) know that there was an occasion. I just never go crazy in Sephora or any other store like most girls. But I do like to take photos if my hair is cute, to capture the moment or sometimes I just feel like it. But we all know the review process that goes into posting it. 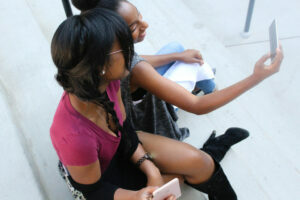 PerfectCorp has an app to make sure that you have a glamorous selfie every time. The YouCam Makeup app allows you to try on tons of different makeup combinations from some of you favorite cosmetic lines or add a little something extra to a selfie. With it’s real time virtual makeover cam, you can see how that new shade of MAC lipstick looks on you. It has facial detection software that actually works really well. Those rosy cheeks that you get from your favorite snapchat filter you can add and tweak right from inside this app. 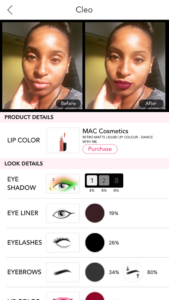 Not to mention that if you like that look you created they have links to the products right in the app! There’s also a hair color and style function in this app too, doesn’t look as realistic as the makeup feature but, I think that’s a little harder to simulate in an app. The YouCam app is available for iOS and Android, and it’s free. I tried it out on myself, you can really give yourself a digital beat right on your phone. Again I’m not a big makeup girl, but if I were this might be an app I’d use often, I mean the few times I have worn makeup it would be nice to see if I liked it before I actually put it on or purchased it, maybe that shade of red doesn’t work on you, or if you really don’t want to bother with the testers in store. Thoughts?